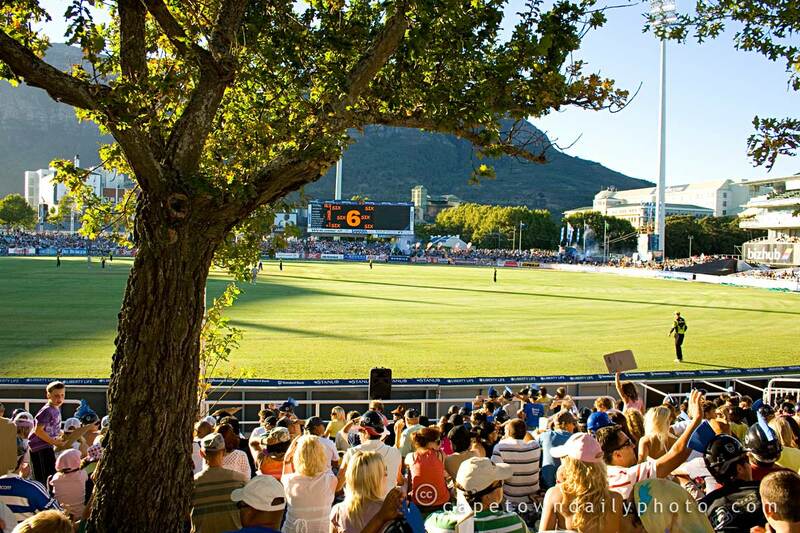 Kerry-Anne was asked to live-blog for the local Standard Bank Pro20 cricket matches at Sahara Park in Newlands. She asked me to tag along to... well, drive her, carry her bags, and take photos. Today's photo was taken from "The Oaks" lawn area - possibly the best seats in the grounds when it comes to atmosphere. It was so packed tonight that we ended up on the (also packed) far lawn, just to the right of the scoreboard (which can be seen heralding the latest 6 to have been batted). The Cape Cobras managed to beat the Warriors by just 5 runs tonight. The Warriors needed 6 runs off the last ball, after losing a wicket on the previous ball. However, it wasn't to be, and the Nashua Cape Cobras went home victorious. Posted in Events and tagged sport on Friday, 23 January, 2009 by Paul. Looks like a lovely day. I have had Sky News for 17 years or so, and they always talk Cricket, but I have never been able to understand anything about the sport! I LOVE Cape Town cricket stadium.